U.S. natural gas prices continue their rollercoaster ride at the height of the heating season, after extreme volatility gripped the market in the fall amid more-than-a-decade low natural gas inventories ahead of the winter. 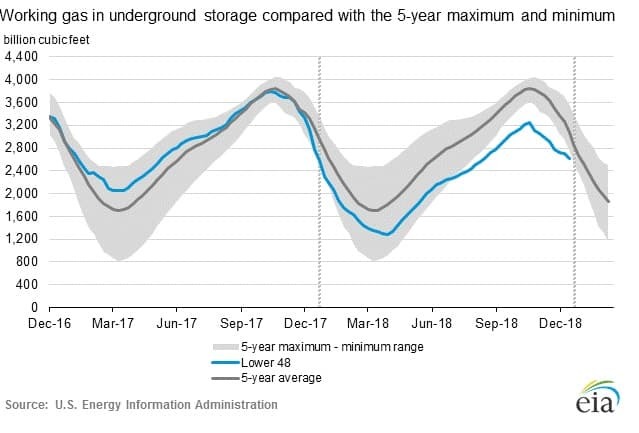 Analysts believe that volatility in the natural gas market will continue to be high through the winter, as inventories below the five-year average and seasonal storage draws make natural gas prices highly vulnerable to changes in the short-term weather models and forecasts. The front-month natural gas futures contract for delivery at the Henry Hub surged by 14 percent at the start of this week, from $2.945 per million British thermal unit (MMBtu) on Friday to $3.289 per MMBtu on Monday. After a relative lull and lower prices over the previous five-six weeks, due to milder winter weather, prices shot up early this week on weather forecasts for a cold snap across the United States. As of January 16, the National Weather Service expected below-average temperatures over the next six to ten days for most of the United States, with very high probability of below-average temperatures in the Midwest. The Monday move was the sharpest price increase since the surge in the middle of November last year, when natural gas prices jumped to $4.80 per MMBtu. Storage at a 15-year low, an unusually cold fall, production freeze-offs, and high exports from Corpus Christi combined to create a perfect storm that sent U.S. natural gas prices to their highest level since the polar vortex of 2014. According to Bluegold Research, the natural gas market has dug itself into a hole during the past injection season—April to September—when it “allowed huge storage deficits to run unchecked during the summer,” allowing the coal-to-gas switching to be at exceptionally high levels in the summer of 2018. The coal-to-gas switching during the whole 2018 injection season rose by 35 percent compared to the five-year average, which left natural gas stocks uncomfortably low at the start of the winter season and primed prices for volatile trading during the winter. So instead of gradual increases during the winter season, natural gas prices now react with extremes to every bullish change in weather forecasts, Bluegold Research reckons. 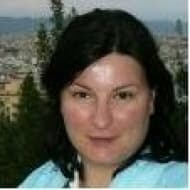 “[B]ullish changes in the weather models are resulting in an extremely exaggerated bullish change in natural gas prices. Prompt-month contract price reaches unjustifiably high levels and can then correct violently even if weather turns only slightly bearish. In other words, prompt month contracts (February contract and, to a lesser degree, March contract) are very speculative and very risky to trade right now,” the analysts said. 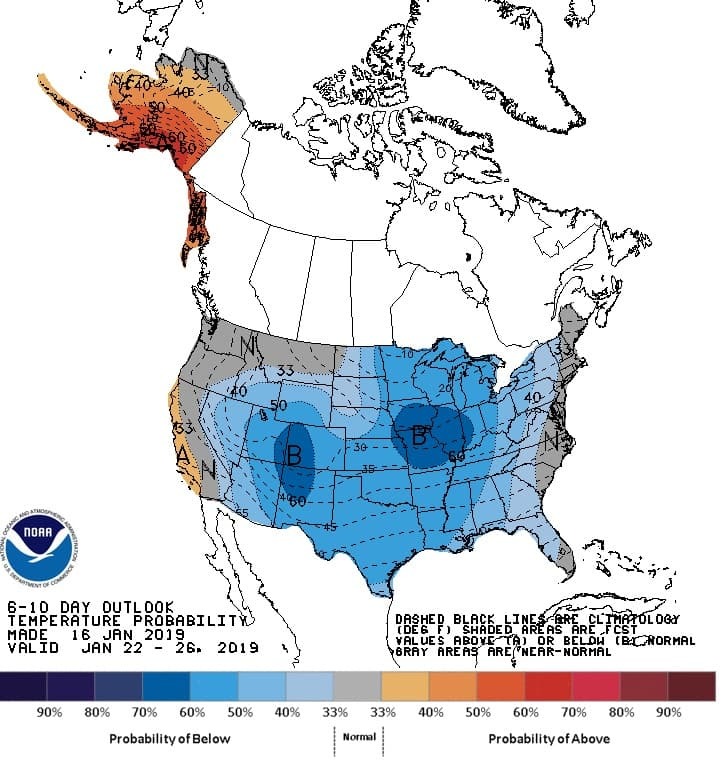 Looking ahead, analysts are not ruling out a return to $4 per MMBtu, if the currently predicted cold snap in the U.S. persists for more than two weeks. Barclays currently expects Henry Hub prices to average $3.51 per mmBtu in Q1 and $2.92 per mmBtu for the whole of 2019. According to the EIA estimates in the January Short-Term Energy Outlook (STEO), Henry Hub spot prices averaged $3.15 per MMBtu in 2018, up 16 cents/MMBtu from the average for 2017. EIA expects Henry Hub spot prices to average $2.89/MMBtu this year and $2.92/MMBtu next year. “Forecast prices are lower than 2018 levels as expected production growth keeps pace with demand and export growth and inventories build faster than the five-year average,” the EIA said in the STEO earlier this week. The length of extreme cold is irrelevant. America is getting older. If you go to your grandparents home then expect the house temperature to be warmer longer. The cold or even chilly weather extends heating season beyond the information process of the natural gas market maker. I believe Chesapeake is cutting natural gas rigs in 2019 and spending more for oil drilling. They aren't alone. The Permian natural gas doesn't supply for very much of the U.S. Markets do they?